In today’s connected, customer-driven marketplace, consumers have the ability to access data and product information from anywhere, but they also have the ability to share their opinions and experiences in the same way. Technology has enabled user-generated content (UGC) to become an integral part of today’s consumer purchasing landscape, as well as play an important role in brand awareness and perception. Regardless of location, consumers are constantly engaging with each other in the digital world, on the internet, through video, and through social channels, because they tend to place greater trust and value in the input and opinions of their peers. 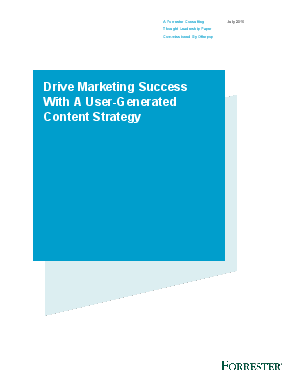 In conducting an online survey of 274 professionals involved with marketing in their organizations, and interviewing five senior marketing professionals from various companies, Forrester discovered that while most companies recognize the value that UGC can provide for marketing purposes, most don’t have a clear strategy for how to best incorporate UGC. Adoption and usage of UGC is still relatively new for most companies, and they are still working to fully understand its value and benefits, as well as to know how to generate and use it. Read this white paper to learn more about their key findings.